If it is anything to go by, the blurb at the back of The Book of Destruction by Anand tells you exactly what to expect from this slim, eerie text. It outlines the narrative trajectory from the first story to the third story in the book without giving anything away. Translated from Malayalam by Chetana Sachidanandan, The Book of Destruction is anything but feel-good—and that’s a good thing. You don’t cuddle up to the book on a lazy day under your covers while sipping some Instagram-worthy fancy tea. Of course, you can start that way, but within a few minutes of reading, you’d be sitting up straight, befuddled at first at just where this sort of opening narrative can go. By the time you’re done with it, you know exactly what you witnessed as a reader. The Book of Destruction is divided into three parts, titled ‘The Gardener’, ‘The Hotelier and the Traveller’, and ‘The Tailor’. They’re meant to be read in order: the first part a horrific proposition, the second its exposition, and the third its musing. 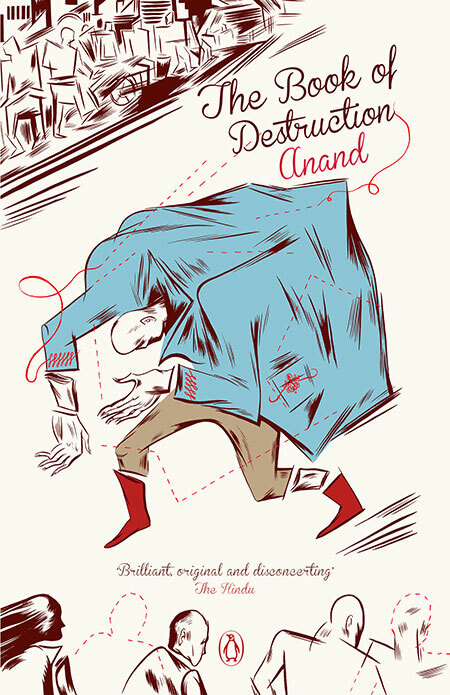 The Book of Destruction book cover. Through his journey in the book, the narrator meets mysterious figures who lead him down a path of disconcerting discoveries relating to cults, thuggee, terrorism, and coincidences, which force him to both listen to, and then become a part of, a larger meditation on the self in relation to life. The contents of a letter written by a dead man find its way to the narrator, who’s then shoved into a journey that takes him through experiences that question destiny, coincidence, and meticulous planning. ‘The Gardener’ is the literary equivalent to an usher, telling you where exactly your seat is in the dingy movie hall, and you rush in to catch the movie that has already begun. ‘The Hotelier and Traveller’ is where The Book of Destruction peaks. It’s a well oiled-machine by this time, purring these strange, eerie facts and questions into your ear. Of the three parts, I found ‘The Tailor’ to be the weakest (and it’s still pretty impressive!). If there’s a thin line between mastering and over-doing a metaphor, Anand almost toes it. But I think it’s the mark of a good author who can take you to the absolute edge for the spectacular view (and what a worldview The Book of Destruction puts forth!) and somehow manage to refrain from jumping off it. The only drawback of the book is that it sorely misses a translator’s or author’s note. Apart from short bios of Anand and Sachidanandan, the book doesn’t give any additional background to the stories. So this “drawback” is really a consequence of good writing. It is precisely because you’ve enjoyed being on this refreshingly original and strange ride that you’d want to know more about the mind that ideated this into existence. However, it’s only a minor quibble. However hard one tries, there’s no apt “summary” to explain what the book is about. Just know that it will make you think. It thrills, it educates, it reveals and titillates the mind. It’s the best history and philosophy lecture you’ve never sat down for, brilliant, engaging discussion—but a little unsettling. You may mistake the book for being a “mystery thriller”, whatever that is, and look for narrative punches to each story. Don’t. What you are certain to find, however, punches nonwithstanding, is that even long after you’ve put down The Book of Destruction, your ears are still ringing.